"An ad is clicked, and a purchase is made. 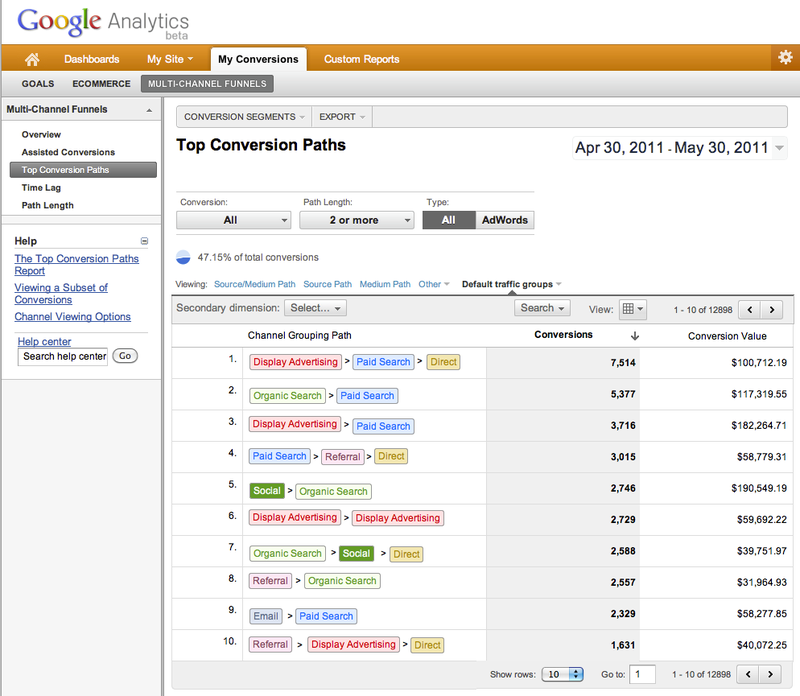 Marketers have long used Google Analytics and similar tools to see which marketing efforts drive sales and conversions. Measurement is fundamental to ROI-focused marketing. Now, we’re taking this measurability a few steps further. When a customer buys or converts on your site, most conversion tracking tools credit the most recent link or ad clicked. In reality though, customers research, compare and make purchase decisions via multiple touch points across multiple channels. So marketers that measure return solely on the last channel that a customer touches before conversion are getting an incomplete picture, and potentially missing out on important opportunities to reach their customers. 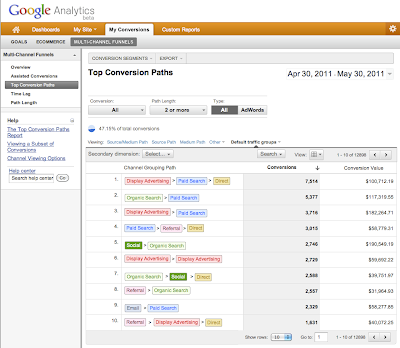 That’s why we’re excited today to introduce Multi-Channel Funnels to all Google Analytics users. This set of five new reports in Google Analytics gives marketers insight into the full path to conversion over a 30 day period, not simply the last click. By looking at interactions across most digital media channels, including clicks from paid and organic searches, affiliates, social networks, and display ads, you can understand how different channels work together to create sales and conversions. We’ve been piloting Multi-Channel Funnels with several customers over the past few months, and we’ve seen our customers gain valuable insight into the buying-cycle and understand the often hidden contribution of channels like social and display to conversions. If you use Google Analytics on your website, and have goals or e-commerce tracking enabled, you can begin using the reports today by clicking on the My Conversions tab, with no further setup required. If you are an AdWords customer, make sure to link your AdWords and Analytics accounts to get the most detail on your ads performance. Starting today, you’ll see complete data in the reports for the past two months, and we’ll be expanding to encompass data back through January 2011 in the coming days. To help you learn more about the type of analysis you can do using Multi-Channel Funnels, including advanced features such as conversion segments and custom channel groupings, we’ll be scheduling a free webinar - look out for the registration details on the blog in a couple of weeks or sign up here to be notified by email. We’ll be walking through the reports and common use cases and you’ll have an opportunity to ask questions - we hope you’ll be able to make it."